We make sure all of the components of your BBQ are clear of dirt and function properly. We also clean the cooking grids and wash your BBQ. Service your patio heater as well and save 10%. This is a total refurbish of your BBQ. 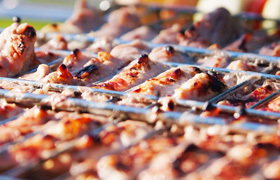 We remove 85-95% of the dirt, grease and carbon buildup from inside and outside your BBQ. We also paint and polish your BBQ and do an overall inspection.